Businesses now “get” the fact that big data technologies can help them wring value out of their legacy — and largely unused — data. The Montreux Jazz Festival, which had archives of music sitting on tape since its 1967 inception, was able to put those performances, long dormant, into streamable form, for example. This ability to monetize unproductive assets, is a huge selling point for big data, said Paul Speciale, VP of products at Amplidata, the object storage company that worked with the festival on that project. So is the ability to look outside your company to see and analyze what users, would-be users, and competitors are saying about your products and services — thus all the talk about analyzing the Twitter firehose and Facebook data. 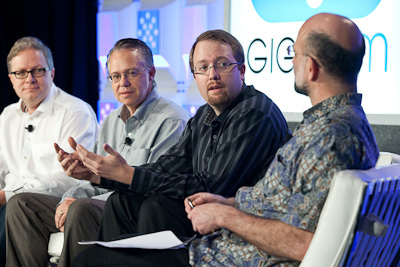 But such projects are fueling expectations for more, better, and faster big data interactions, according to speakers at the GigaOM Structure:Data 2012 event in New York on Wednesday. The advent of consumer technologies like the iPhone’s (s aapl) Siri have educated consumers about the need and application of natural language processing. The ability to handle unstructured speech is a key component of many big data applications. This exploding demand means the technologies around outputting data in a useable, understandable format, ingesting it into storage so that it’s manageable and searchable, and the analytics to parse that data so it’s useable will only grow. Watch the livestream of the event here. Wow, I (the moderator) don’t even merit a mention, not even given the remarks I made are relayed in the article (” The advent of consumer technologies like the iPhoneâ€™s Siri have educated consumers about the need and application of natural language processing. The ability to handle unstructured speech is a key component of many big data applications.”)?